Thrift stores are great. They always have been. Long before some of them split off and became vintage clothing stores, long long before Macklemore started wearing your grandpa's clothes, thrift stores were a staple for my family. Where else can you get 3 pairs of gently used size 7T jeans for $12? Or five awesome dress up costumes for $20? How about a New Zealand All Blacks jersey for $6? (OK, maybe a lot of places, but stay with me.) Our family is (by choice) living on one income, and the random money I pull in living the Interdisciplinary Life, so we need to save where we can. One area where we save money is in not always buying new clothes that the kids are going to either destroy or grow out of in six months. (BTW, you ever notice the two or three year cycle of kids looking like 1990s hip hop artists in super baggy clothes that they'll grow into, and then later looking like extras on The Big Bang Theory as they grow out of those same clothes?) So whether it's Goodwill or Value Village I'm all about the thrift stores. Which brings me to today's tale. The Boy had somehow found himself in a world where he had outgrown his 5T pants and had only 8T pants in reserve, which weren't working. He may actually have been the inspiration for the rebirth of Jnco jeans. So off I went to our local thrift store in search of 7T jeans (he'll grow into them). I brought along Lou an Yo since leaving them at home is apparently some sort of crime. As soon as we got out of the car Lou was begging me for toys. For some reason she only does this at thrift stores. If I take her to a toy store to shop for gifts for other people she doesn't make a peep. For some reason the allure of second hand Guitar Hero controllers and sandwich bags full of Happy Meal toys is too much to bear. This time it was a full on sob fest complete with a long explanation of how she doesn't really have any toys of her own that she likes because all the toys she has are shared with The Boy. She kind of had a point, but I was not giving in to the tantrum. We whiled away a miserable half hour picking out a few pairs of pants and shoes for The Boy and headed to the check out aisle. The only open register was the one they kept the fancy stuff behind, and that's where I saw it. If you've ever been to the toy aisles of a typical thrift shop you know that they are a wasteland of plastic crap and two generation old gaming systems. They're terrible. The only redeeming thing you might find is a prefabricated play kitchen that still has most of the decals intact. Despite knowing this I occasionally (every time the kids aren't with me) stroll down the lane hoping for some overlooked treasure. I especially keep an eye out for Legos even though I know it's a fool's errand. No one gives away Legos. I love Legos. I always have. I had a big Lego suitcase full Legos that I cherished as a kid. One of my fondest memories was a Lego firehouse I got for Christmas one year. I couldn't have been older than five, but I was able to put it together myself. My kids love Legos. Legos have only gotten better over the last 35 years and now that I have kids I have an excuse to play with Legos. The thing is, Legos are expensive. 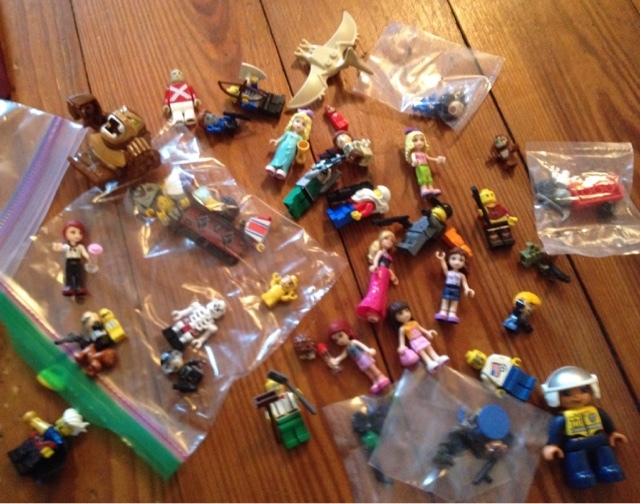 Like, I suffered sticker shock when I started looking for sets for the kids a couple years ago. So our Lego collection is modest and I'm always on the lookout for deals. All this is to say that what I found behind that counter made my heart leap. There behind the counter was the biggest tub of Legos I've ever seen outside of a toy store. It was one of those clear plastic storage bins people use to store picnic supplies or winter coats, and it was full to the brim with Legos. It was the holy grail of the thrift store. But I couldn't be seen buying toys by my grumpy four-year-old. So I devised a plan wherein I paid for the bin, brought the kids and clothes to the car, drove around to the front of the store and loaded the bin in the back with no child being the wiser. A man who seemed to be knowledgeable about such things asked me how much I had paid for my bounty. It wasn't much considering the haul. He asked a series of questions that led me to conclude that he was one of those folks who get good deals at thrift shops and then re-sell the items to vintage shops or on eBay for a profit. "Oh no," I told him, "I'm not a collector, I'm just going to throw these in the play room and let the kids have at it." I'm not actually going to that, though I'd love to see the looks on their faces if they walked in and saw this ark of Lego wonders. The reality is we don't have the space for that right now so I'll have to dole them out in bits while T and I come up with a viable storage plan. I stayed up late into the night trying to catalog my new treasure. It proved an impossible undertaking for one night. What I was thrilled to find was that whoever donated the bin had been thoughtful enough to include many of the instruction manuals for the sets that I now presume are in the box. It's a fun mix of old and new sets. Sometimes you can hold a Lego in your hand, feel the difference in the plastic and you know for sure it's a brick from your childhood. Overall the box is about 85% Legos, 10% Kreo, and 5% K'nex, including a very old looking Space Shuttle Columbia set. 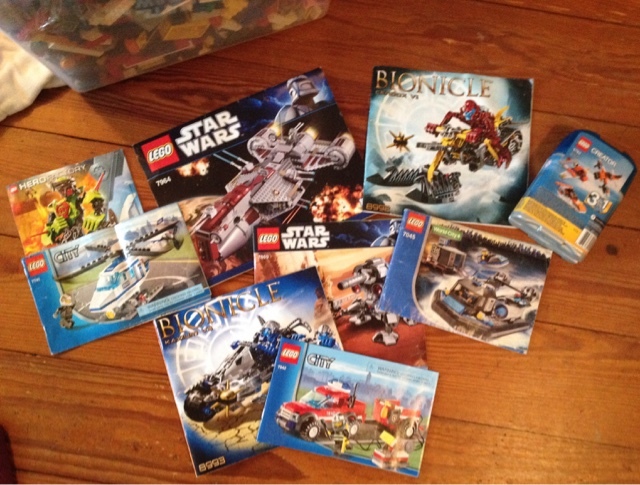 There's a couple of Lego City sets, a couple Star Wars sets, more than a few Bionicles, and even some Lego Friends and a Kreo Barbie set for Lou. Yes, I also kind of hate the idea of Lego Friends, but Lou loves them. in fact, it's the lack of Friends types of toys in our home that had her in a funk to begin with. So I was stoked to find the willowy figures. Though the sets are impossibly jumbled a quick search of the internet indicates there's likely $800 or more worth of blocks in the box. Thanks to that same internet it may be possible to find the instruction manuals for some sets I can identify but don't have books for. If not, I'm actually more excited at the idea of just having thousands of free play bricks for the kids to run wild with. I'm still debating if I'll try to salvage and build the Republic Frigate myself. I've been trawling thrift stores for 25 years on my own, and long before that with my mom. I've come up with normal items of clothing. I've scored great deals on a variety of jerseys. I even worked at a vintage store during college. 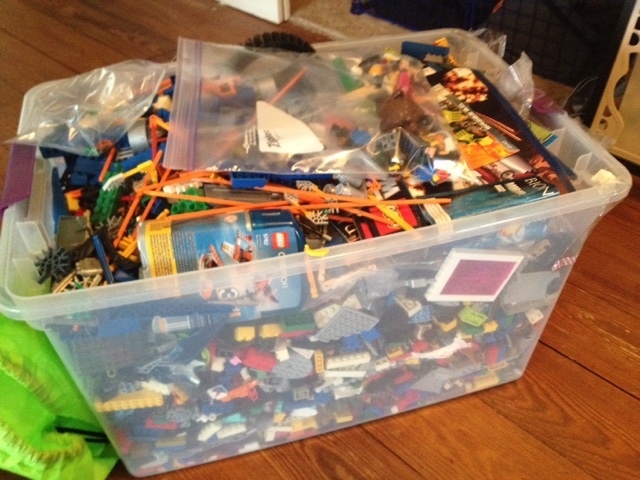 I can say with great certainty that this giant bin of Legos is the greatest thrift store find I've ever made. It's very likely that I'll spend the rest of my life in a downward spiral starting with weekly thrift store trips and ending in blowing the kids' college funds bidding on storage lockers in a vain attempt to recapture this feeling.